Ashley Dixon will share information on purchasing real estate as a way to accumulate wealth. programs designed to emphasize financial planning, asset accumulation, and wealth building. free workshops for the community. We encourage everyone to attend this informative event. Can’t make it to Marietta, Ga? No worries, we’ve got you covered! This year’s event includes a 5K, a Virtual 5K and the 1K Rudolph Run. The race is a Peachtree Qualifying Race and features electronic chip timing to ensure accuracy for all runners. Proceeds from this event will support the scholarship fund and other community initiatives benefitting Cobb County. We have awarded over $300,000 in scholarships to high school seniors in Cobb County. The race is sponsored by The PEARL Foundation, Inc. and the Rho Zeta Omega Chapter of Alpha Kappa Alpha Sorority, Inc. The PEARL Foundation, Inc. and Alpha Kappa Alpha Sorority, Inc., Rho Zeta Omega Chapter will host the signature fundraising event in support of the scholarship fund and other Cobb County community programs. Plan to join us at the Mason Fine Art Gallery as we salute the Harlem Renaissance through music, fashion and art. Stay tuned for details on ticket purchases for this exquisite event! 2012 recipient of the Creating Community Award from the Cobb County Board of Commissioners and the Cobb Community Relations Council in recognition of community service in Cobb County. 2012 recipient of a proclamation from the City of Powder Springs, Georgia in recognition of the Emerging Young Leaders mentoring program at Tapp Middle School. 2016 recipient of the MCS Angels Award from Marietta City Schools for the Kids Club after school program at Park Street and Lockheed Elementary Schools. 2016 Cobb Chamber of Commerce Outstanding Partner in Education and induction into the Partner in Education Hall of Fame. Partnered with Home Depot to build an outdoor playground and sensory garden at Park Street Elementary. Also partnered with Home Depot to revitalize playgrounds at the MDE School, Lockheed Elementary, and Sedalia Park Elementary. The members of The PEARL Foundation, Inc. are committed to the next 10 years of providing scholarships and community initiatives to the residents of Cobb County. Thank you to all race participants and race sponsors for making the 2018 Dashing Through the Square 5K on December 15, 2018 a big success. Please click the on the link below to see some pictures from the race. Saturday, December 21, 2019. We hope to see you there! Alpha Kappa Alpha Sorority, Inc., the first African-American Greek-letter sorority, was founded on a mission comprised of five basic tenets which has remained unchanged since our inception in 1908. The international sorority has grown to over 760 undergraduate and alumnae chapters focusing on academic excellence and community service. 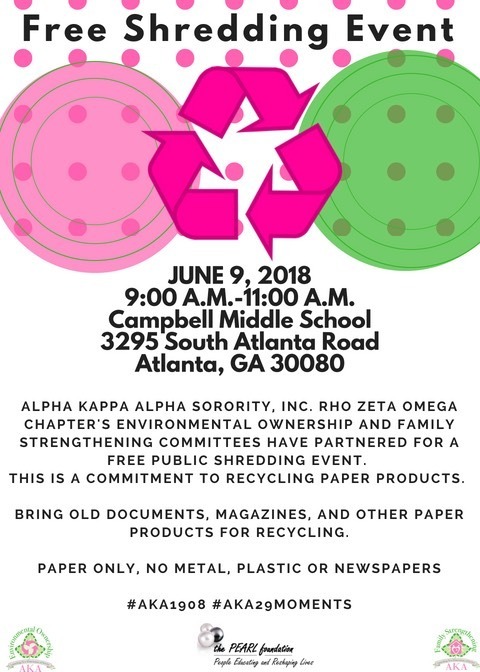 Locally, the Rho Zeta Omega chapter serves the Cobb County/Marietta community. 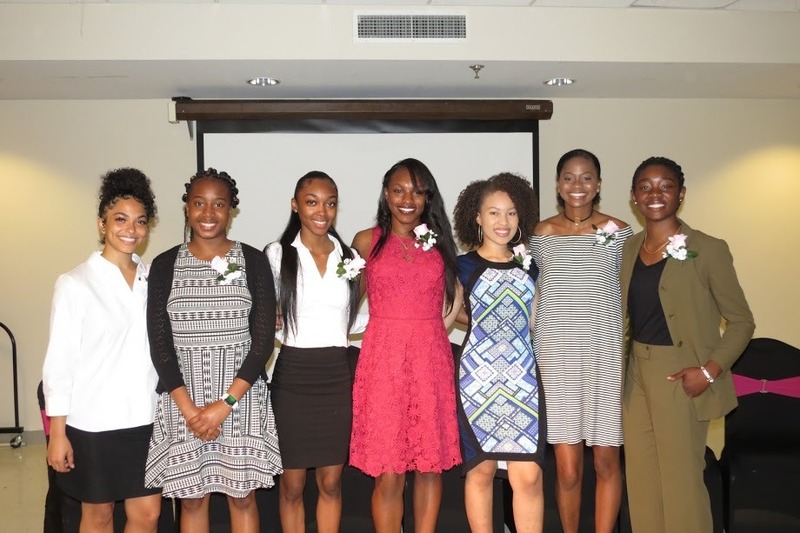 In keeping with one of our basic tenets which is to cultivate and encourage high scholastic and ethical standards, the Rho Zeta Omega chapter along with its philanthropic arm, The PEARL Foundation, Inc., will offer several academic scholarships to advance the education of African American females who are graduating seniors of Cobb County or Marietta City high schools for the upcoming academic year. There are TWO scholarship categories and multiple awards will be given, BUT an applicant is only eligible to receive one scholarship award, to be determined by the Scholarship Committee. Interested students may apply for scholarships in one or both of the following categories. There will be multiple awards in this category. These scholarships will be awarded to applicants who will attend ANY four-year college or university. This inaugural scholarship will be awarded to an applicant who will attend a Historically Black College or University. Mrs. Danzy was the person who led the vision of chartering Rho Zeta Omega in Cobb County and served as the chapter’s first president. She was a proud graduate of Spelman College (1970) and Clark Atlanta University (1972). Qualified applicants must participate in a panel interview in March 2019. 12-point Times New Roman Font. If you are applying for both scholarships, you must submit two separate essays. An applicant is only eligible to receive one scholarship award, to be determined by the Scholarship Committee. no later than 11:59pm, Monday, February 18, 2019. NO EXCEPTIONS! An application that is missing items will be considered incomplete and will not be considered for an award. NO EXCEPTIONS! The PEARL Foundation and LaSonya, the owner of LL Dance and Fitness LLC invite all to join us on Saturday, December 1, 2018 at 10:30 AM EST for a great dance fitness sweaty time to support PEARL program initiatives and to get in an awesome workout. The PEARL Foundation Inc. in conjunction with Alpha Kappa Alpha, Sorority, Inc. Rho Zeta Omega Chapter is now accepting applications for the 2018 #CAP Program. TEST: Preparing, scheduling and taking required tests such as ACT, SAT, PSAT, etc. Accepted applicants will be notified via email and U.S. mail with an invitation to the #CAP kick-off scheduled for Sunday, November 11, 2018. If there are any questions or require further information, please contact the #CAP Chairmen, Kim Boyd and Victoria Jenkins at PZOCAP@gmail.com. 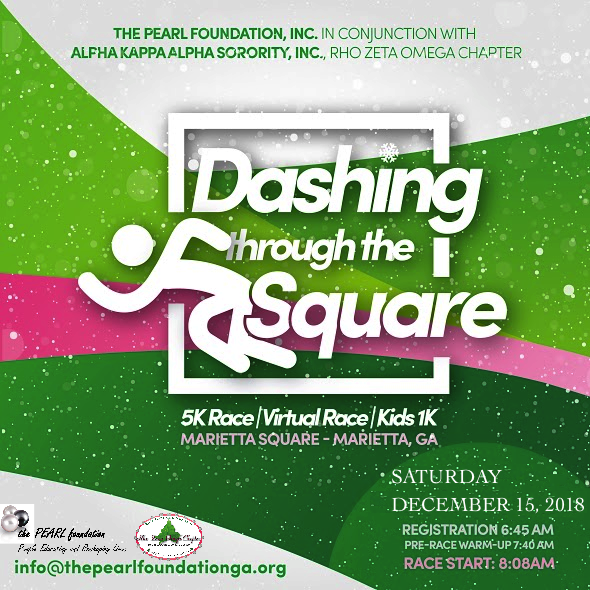 Join us on December 15, 2018 for the third annual “Dashing through the Square 5K Race" through historic Marietta, GA! This year's event includes a 5K, a Virtual 5K and the 1K Rudolph Run. The race is a Peachtree Qualifying Race and features electronic chip timing to ensure accuracy for all runners. Proceeds from this event will support the scholarship fund and other community initiatives benefiting Cobb County. We have awarded over $300,000 in scholarships to high school seniors in Cobb County. This race is sponsored by The PEARL Foundation, Inc. and Alpha Kappa Alpha Sorority, Inc., Rho Zeta Omega Chapter. 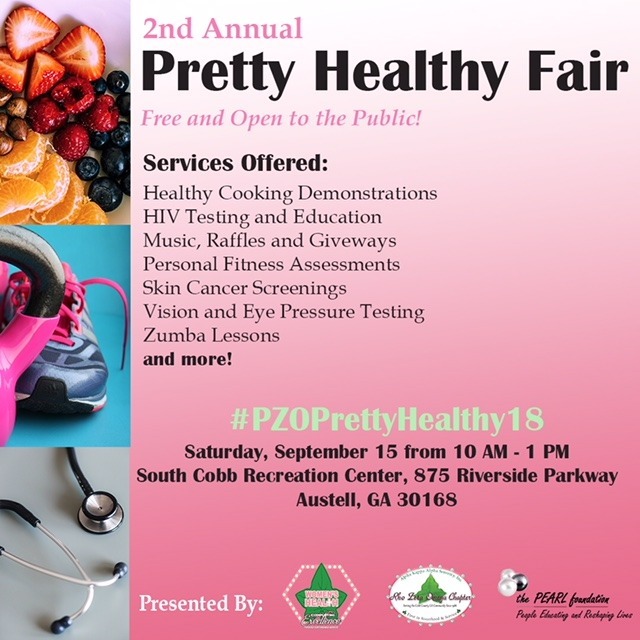 The PEARL Foundation, Inc. in conjuntion with the Rho Zeta Omega Chapter of Alpha Kappa Alpha Sorority Inc. will host a Health Fair on Saturday, September 15, 2018 from 10:00 a.m. - 1:00 p.m. at the South Cobb Recreation Center located at 875 Riverside Parkway, Austell, Ga. 30168. Bring your friends and family for a variety of service offerings such as vision and eye pressure screening, skin cancer screening, and information on strokes, heart disease and Alzheimer's disease. Bring your old or out of date medicines for safe disposal. All attendees are encouraged to RSVP via email at pzohealthfair@gmail.com. We hope to see you there!! A Midday Rhapsody of Art & Soul - September 22, 2018 - Tickets On Sale Now! A Midday Rhapsody of Art & Soul returns as one of the Fall premier events! 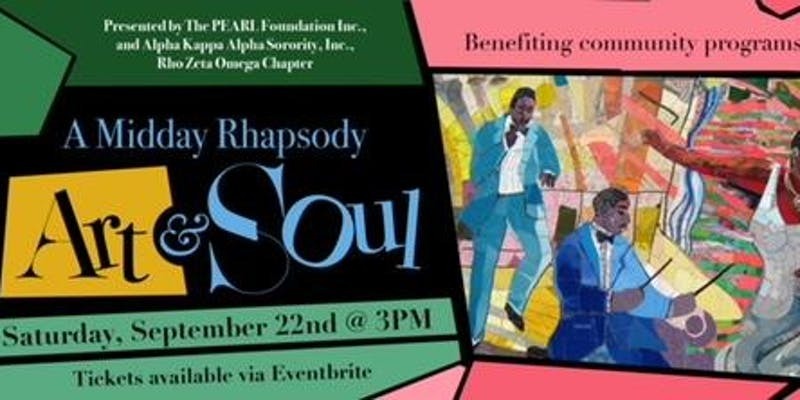 On September 22, 2018, The PEARL Foundation, Inc., and Rho Zeta Omega Chapter of Alpha Kappa Alpha Sorority, Inc., will host its annual, A Midday Rhapsody of Art & Soul, fundraising event to raise funds in support of our scholarship fund and other Cobb County community programs. The VIP Experience is the most exclusive way to enjoy this marvelous event. Relax in the comfort of reserved seating in our VIP Lounge. Every VIP Experience ticketholder will go home with a fabulous gift! Recipients were selected based on academic achievements, community service, and leadership positions held in their school and community. They also had to complete an interview with members of the scholarship committee. The young ladies were honored at the annual scholarship reception which was held on May 5, 2018 at Zion Baptist Church in Marietta, Georgia. Mr. Brad Wheeler, Chairman, Cobb County School Board attended the reception. Dr. Latoya Griffin, founder of Secret Miracles Unlimited Foundation, Inc. was the keynote speaker. Members of The PEARL Foundation, Inc. extend a special acknowledgement to our Diamond Level corporate sponsors, the J.C. Penney Corporation, Home Depot and T-Mobile. Please join us for the Teen Domestic Violence Forum on February 24, 2018 from 10:00 a.m. – 1:00 p.m. The forum will be held at Lindley Middle School, 50 Veterans Memorial Highway SE, Mableton, Ga. 30126. The forum will include an open discussion on the harrowing reality of teen domestic violence. Must be an African-American female who resides in Cobb County. Qualified applicants must participate in a panel interview on Sunday, March 4, 2018. Applicants are strongly encouraged to attend a Skills Development Workshop presented by Rho Zeta Omega Chapter scheduled for Sunday, February 25, 2018. Those who plan to attend must RSVP at pzoscholarship@gmail.com no later than February 20, 2018. All applications and supporting materials must be uploaded by midnight on Monday, February 19, 2018, NO EXCEPTIONS! High school transcript (submitted by the school to pzoscholarship@gmail.com). Two letters of recommendation (completed by school official, church/community leader) - (submitted to pzoscholarship@gmail.com).